Here, we present a protocol for fabrication of a closed-type wireless nanopore electrode and subsequent electrochemical measurement of single nanoparticle collisions. Gao, R., Cui, L. F., Ruan, L. Q., Ying, Y. L., Long, Y. T. A Closed-Type Wireless Nanopore Electrode for Analyzing Single Nanoparticles. J. Vis. Exp. (145), e59003, doi:10.3791/59003 (2019). Measuring the intrinsic features of single nanoparticles by nanoelectrochemistry holds deep fundamental importance and has potential impacts in nanoscience. However, electrochemically analyzing single nanoparticles is challenging, as the sensing nanointerface is uncontrollable. To address this challenge, we describe here the fabrication and characterization of a closed-type wireless nanopore electrode (WNE) that exhibits a highly controllable morphology and outstanding reproducibility. The facile fabrication of WNE enables the preparation of well-defined nanoelectrodes in a general chemistry laboratory without the use of a clean room and expensive equipment. One application of a 30 nm closed-type WNE in analysis of single gold nanoparticles in the mixture is also highlighted, which shows a high current resolution of 0.6 pA and high temporal resolution of 0.01 ms. Accompanied by their excellent morphology and small diameters, more potential applications of closed-type WNEs can be expanded from nanoparticle characterization to single molecule/ion detection and single-cell probing. Nanoparticles have attracted tremendous attention due to diverse features such as their catalytic ability, particular optical features, electroactivity, and high surface-to-volume ratios1,2,3,4. Electrochemical analysis of single nanoparticles is a direct method for understanding the intrinsic chemical and electrochemical processes at the nanoscale level. To achieve highly sensitive measurements of single nanoparticles, two electrochemical approaches have been previously applied to read out nanoparticle information from current responses5,6,7. One of these approaches involves immobilizing or capturing an individual nanoparticle on the interface of the nanoelectrode for the study of electrocatalysis8,9. The other strategy is driven by single nanoparticle collision with the surface of an electrode, which generates a transient current fluctuation from the dynamic redox process. Both of these methods require a nanoscale ultrasensitive sensing interface that matches the diameter of single nanoparticles. However, traditional fabrication of nanoelectrodes has mainly incorporated the micro-electromechanical systems (MEMS) or laser pulling techniques, which are tedious and undisciplinable10,11,12,13. For example, MEMS-based fabrication of nanoelectrodes is expensive and requires the use of a clean room, restricting the massive production and popularization of nanoelectrodes. On the other hand, laser pulling fabrication of nanoelectrodes relies heavily on experience of the operators during the sealing and pulling of a metal wire inside the capillary. If the metal wire is not well-sealed in the capillary, the gap between the inner wall of the nanopipette and wire can dramatically introduce excess background current noise and enlarge the electroactive sensing area. These drawbacks largely decrease the sensitivity of the nanoelectrode. On the other hand, the existence of a gap can enlarge the electrode area and reduce sensitivity of the nanoelectrode. As a consequence, it is hard to guarantee a reproducible performance due to the uncontrollable electrode morphologies in each fabrication process14,15. Therefore, a general fabrication method of nanoelectrodes with excellent reproducibility is urgently needed to facilitate electrochemical exploration of the intrinsic features of single nanoparticles. Recently, the nanopore technique has been developed as an elegant and label-free approach for single molecule analysis16,17,18,19,20. Owing to its controllable fabrication, the nanopipette provides a nanoscale confinement, with a uniform diameter ranging from 30-200 nm by a laser capillary puller21,22,23,24. Moreover, this simple and reproducible fabrication procedure ensures the generalization of the nanopipette. Recently, we proposed a wireless nanopore electrode (WNE), which does not require the sealing of a metal wire inside the nanopipette. Through a facile and reproducible fabrication process, the WNE possesses a nanoscale metal deposition within the nanopipette to form an electroactive interface25,26,27,28. Since the WNE possesses a well-defined structure and uniform morphology of its confinements, it achieves high current resolution as well as low resistance-capacitance (RC) time constant for performing high temporal resolution. We previously reported two types of WNEs, open-type and closed-type, for realizing single entity analysis. The open-type WNE employs a nanometal layer deposited on the inner wall of a nanopipette, which converts the faradic current of a single entity to the ionic current response26. Usually, the diameter of an open-type WNE is around 100 nm. To further decrease the diameter of WNE, we presented the closed-type WNE, in which a solid metal nanotip fully occupies the nanopipette tip through a chemical-electrochemical approach. This method can rapidly generate a 30 nm gold nanotip inside a nanopore confinement. The well-defined interface at the tip area of a closed-type WNE ensures a high signal-to-noise ratio for electrochemical measurements of single nanoparticles. As a charged gold nanoparticle collides with the closed-type WNE, an ultrafast charging-discharging process at the tip interface induces a capacitive feedback response (CFR) in the ionic current trace. Compared to a previous single nanoparticle collision study via a nanoelectrode with metal wire inside29, the closed-type WNE showed a higher current resolution of 0.6 pA ± 0.1 pA (RMS) and higher temporal resolution of 0.01 ms.
Herein, we describe a detailed fabrication procedure for a closed-type WNE that has highly controlled dimensions and outstanding reproducibility. In this protocol, a simple reaction between AuCl4- and BH4- is designed to generate a gold nanotip that completely blocks the orifice of a nanopipette. Then, bipolar electrochemistry is adopted for continuous growth of a gold nanotip that reaches the length of several micrometers inside the nanopipette. This simple procedure enables the implementation of this nanoelectrode fabrication, which can be carried out in any general chemistry laboratory without a clean room and expensive equipment. To determine the size, morphology, and inner structure of a closed-type WNE, this protocol provides a detailed characterization procedure with use of a scanning electron microscope (SEM) and fluorescence spectroscopy. One recent example is highlighted, which directly measures the intrinsic and dynamic interactions of gold nanoparticles (AuNPs) colliding towards the nanointerface of a closed-type WNE. We believe that the closed-type WNE may pave a new path for future electrochemical studies of living cells, nanomaterials, and sensors at single-entity levels. NOTE: Pay attention to general safety precautions for all chemicals. Dispose of chemicals in a fume hood, and wear gloves, goggles, and a lab coat. Keep flammable liquids away from fire or sparks. All aqueous solutions were prepared using ultrapure water (18.2 MΩ cm at 25 °C). The prepared solutions were filtered using a 0.22 μm pore-size filter. Dissolve 0.074 g of potassium chloride in 100 mL of deionized water. Dissolve 0.018 g of sodium borohydride in 10 mL of ethanol. Dissolve 0.010 g of potassium chloride in 1 mL of 1% chloroauric acid solution. Mix silicone rubber containing Part A and Part B (see Table of Materials) at a ratio of 1:1 by volume. Use the mixed silicone rubber to paint a reaction area at the slide immediately during the pot time of 1 min. Cure the prepared silicone rubber on the slide for 5 min. Add 4.8 mL of chloroauric acid with a mass fraction of 1% into 40 mL of deionized water with vigorous stirring. Heat the solution to a boil. Quickly add 10 mL of a trisodium citrate solution with a mass fraction of 1% into the solution. Heat the solution for an additional 15 min until the final solution is red in color. NOTE: In our case, the chloroauric acid solution was rapidly reduced by trisodium citrate, and it was observed that the solution rapidly changed from clear-yellow to dark-black. Switch on the voltage-clamp mode. Set the filter bandwidth to 10 kHz and sampling rate to 100 kHz. Assemble a self-designed specific homemade copper cage to shield external noise for experimental cells and the pre-amplifier on the inverted microscope (see Table of Materials). Ground the shell of the Faraday cage, shells of the amplifier, and inverted microscope system. Generation of the gold nanotip inside the nanopipette is monitored by the dark-field microscope. NOTE: An inverted microscope system (see Table of Materials) is used to take images and scatter spectra. A true-color digital CCD camera is employed to take images of the nanopipette and nanopore electrode. A dark-field condenser [numerical aperture (NA) = 0.8–0.95)] is utilized to form a dark-field illumination. 10X (NA = 0.3), 20X (NA = 0.45), and 40X (NA = 0.6) objectives are used to collect images of the closed-type WNE. Fluorescence detection is used to further verify whether there are gaps between the nanotip and inner wall of the nanopipette. This experiment is performed by another EMCCD (see Table of Materials) also integrated on the inverted microscope, and the excitation light is a built-in mercury lamp with a band-pass filter of 450–490 nm. Put the quartz capillaries (see Table of Materials) in a 15 mL centrifuge tube filled with acetone for 10 min of ultrasonic cleaning. Pour off acetone, then add ethanol into the same centrifuge tube. Put the centrifuge tube in an ultrasonic cleaner for 10 min of cleaning. Put the capillaries into another 15 mL centrifuge tube with deionized water for removal of the ethanol, with 10 min of ultrasonic cleaning. Continually ultrasonic clean the capillaries three times with deionized water to remove the residual ethanol. Dry the capillaries using a nitrogen gas stream. Keep the capillaries in a new, clean centrifuge tube. Preheat the puller for 15-20 min to ensure a steady laser power. Install the cleaned capillary in the puller. Set the pulling parameters of heat, filament, velocity, delay, and pulling force on the panel of the CO2 laser puller for a specific diameter. The detailed parameter for pulling a 30 nm diameter nanopipette in this protocol is shown in Table 1 (Figure 1). Fix the prepared nanopipette on a Petri dish with the reusable adhesive (see Table of Materials) for further characterization. Inject 10 μL of the prepared HAuCl4 solution into the nanopipette with a microloader. Centrifuge the nanopipette for 5 min at around 1878 x g for the removal of air bubbles in the nanopipette. NOTE: For this step, we placed the nanopipette with the tip facing down into a homemade holder within a 2 mL centrifuge tube. Fix the nanopipette on a coverslip with the prepared silicone rubber (see step 1.4) and define the area inside the nanopipette as the “cis” side and outside as the “trans” side. Wait 5 min until the rubber is cured. Put the integrated ensemble on the objective table of the inverted microscope. Turn on and adjust the dark-field illumination to focus the nanopipette tip under a 10X microscope objective. Change to 20X and 40X objectives for a higher spatial resolution. Place one Ag/AgCl electrode inside the nanopipette. Place the other grounded Ag/AgCl electrode into the trans side. Connect a pair of Ag/AgCl electrodes to the pre-amplifier. Turn on the current measurement system and the corresponding software (see Table of Materials) for ionic current recording. Set the applied potential to 300 mV. Slowly add 150 μL of NaBH4 solution into the trans side to trigger the reaction between HAuCl4 and NaBH4 (Figure 2). NOTE: The reduction of NaBH4 in aqueous solution takes place at a violent reaction rate. Therefore, the generation of H2 from the reduction of NaBH4 may induce a defective structure of the nanotip by the generation of cavities during the gold nanotip growth. Simultaneously, electrically and optically record the current trace and the dark-field image/scattering spectra using the current measurement and dark-field detection systems (Figure 3). NOTE: The ethanol solution is volatile under dark-field illumination. Pay attention to the volume of ethanol during the fabrication process. Turn off the applied potential after ionic current tracing back to 0 pA.
Wash the prepared closed-type WNE with flowing deionized water from the bottom to the tip. Characterize closed-type WNE with a scanning electron microscope (SEM), which is a general method for characterization of nanopipettes22,31,32,33,34. Use a calcium ion fluorescent experiment to verify the sealing condition of the gold nanotip inside the nanopipette. Inject 10 μL of CaCl2 solution into the cis side of the closed-type WNE and Fluo-8 solution into the trans side. Connect the Ag/AgCl electrodes to the headstage. Apply a 400 mV bias potential and use the EMCCD (see Table of Materials) to monitor the fluorescence response at the tip area. Use focus ions beam (FIB) to sculpt the closed-type WNE from the tip to the bottom, then determine the length of the interior metal layer or nanotip with SEM characterization. Change the solution in the trans and cis sides to a KCl solution after fabrication of the closed-type WNE. Transfer 50 μL of 30 nm gold nanoparticle solution into the trans side. Record the current signal of single nanoparticle collision events at a potential of 300 mV (Figure 5). Change the applied voltage to monitor the frequency, amplitude, and shape change of the current signal. We demonstrate a facile approach to fabricate a well-defined 30 nm wireless nanopore electrode based on a quartz conical nanopipette. The fabrication of a nanopipette is demonstrated in Figure 1, which includes three main steps. A microcapillary with an inner diameter of 0.5 mm and outer diameter of 1.0 mm is fixed in the puller, then a laser is focused on the center of the capillary to melt the quartz. By applying forces to the terminals of the capillary, it finally separates and forms two parts with nanoscale conical tips. The pulling parameters are provided in Table 1 for fabricating 30 nm nanopipettes in our lab. It should be noted that the parameters can vary from different laser pullers. Experimenters should adjust the parameters according to the laser power, temperature, and humidity. After fabrication, SEM characterization is required to verify the true diameter of the nanopipette. Figure 2 shows the procedure of generating a gold nanotip inside the nanopipette tip after the pulling process. 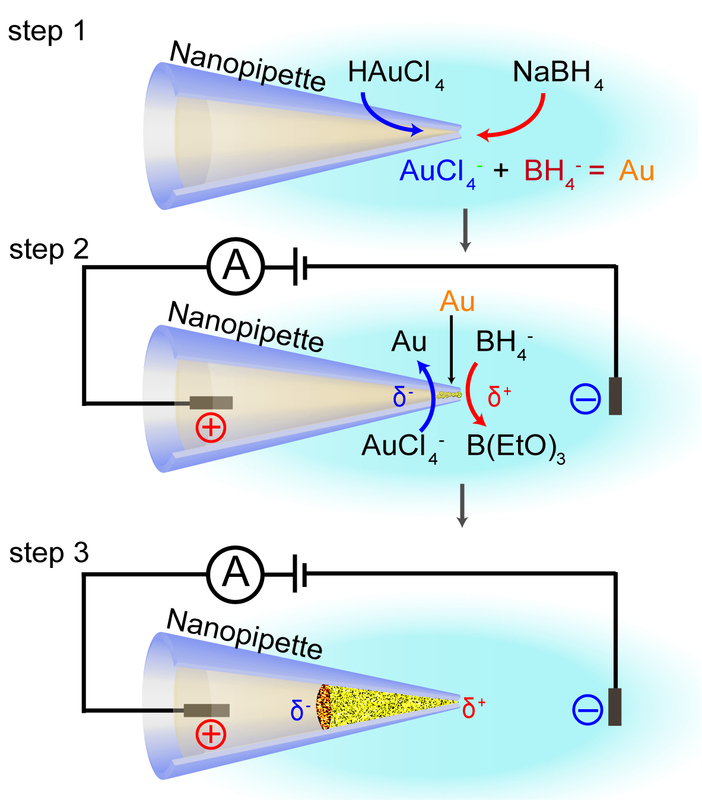 First, the AuCl4- inside the nanopipette is consistently reduced by BH4- to generate a gold nanotip until the opening of nanopipettes is fully blocked. Then, the bipolar electrochemistry promotes the further growth of the gold nanotip. We used an in situ characterization system to monitor the fabrication process of the closed-type WNE by simultaneous recording of the current response and dark-field images (Figure 3). As for the SEM characterization, Figure 4 shows top view SEM images of the bare nanopipette and closed-type WNE. 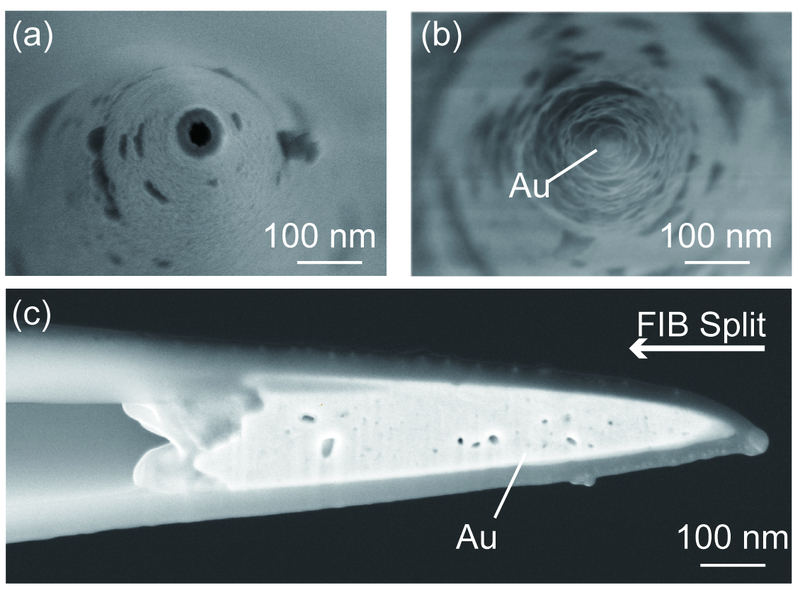 After FIB splitting, a side view SEM image provides the morphology of the gold nanotip inside the closed-type WNE. In the single-nanoparticle collision experiments, the gold nanoparticles are added to the trans side of the WNE. The outstanding noise performance of this CNE uncovers the hidden signals with a high signal frequency (Figure 5). Figure 1: Fabrication of nanopipettes. The procedure for fabrication is as follows: step 1) install a microcapillary in a laser puller; step 2) heat the middle of the capillary with a CO2 laser and apply force at the ends of the capillary to pull it; and step 3) the capillary tapers down and separates into two symmetric nanopipettes in several seconds. Please click here to view a larger version of this figure. Figure 2: Fabrication of the closed-type WNE. Step 1) HAuCl4 and NaBH4 solutions are added to the cis and trans sides of the nanopipette, respectively. AuCl4- is reduced by BH4- to generate gold at the nanopipette orifice. Step 2) After the orifice is blocked by generated gold, the bipolar electrochemical reaction takes place with the applied potential for further growth of the gold nanotip. Step 3) A closed-type WNE is finally fabricated with a micrometer-length gold nanotip. This figure has been modified with permission from previous work25. Please click here to view a larger version of this figure. Figure 3: Simultaneous electrical monitoring and scattering recording during closed-type WNE fabrication. (A) After addition of NaBH4 in the trans side of the nanopipette, the current drops immediately from 0 pA. Then, the current trace experiences a quick transition due to the generation of gold. After ~150 s, the current returns to 0 pA, demonstrating complete blockage of the nanopipette. (B) Dark-field images during WNE fabrication at corresponding timepoints of 0 s, 10 s, 100 s, and 150 s. This figure has been modified with permission from previous work25. Please click here to view a larger version of this figure. Figure 4: SEM characterizations of the nanopipette and closed-type WNE. (A) Top view SEM image of a pulled nanopipette with a diameter of 30 nm. (B) Top view SEM image of a closed-type WNE with a diameter of 30 nm. (C) Side view SEM image of a closed-type WNE after FIB splitting from the tip to the back of the nanopipette. Please click here to view a larger version of this figure. Figure 5: Single nanoparticle collision detection with a closed-type WNE. (A) 30 nm gold nanoparticles are added to the trans side solution. A pair of Ag/AgCl electrodes are employed to apply a bias potential of 300 mV. 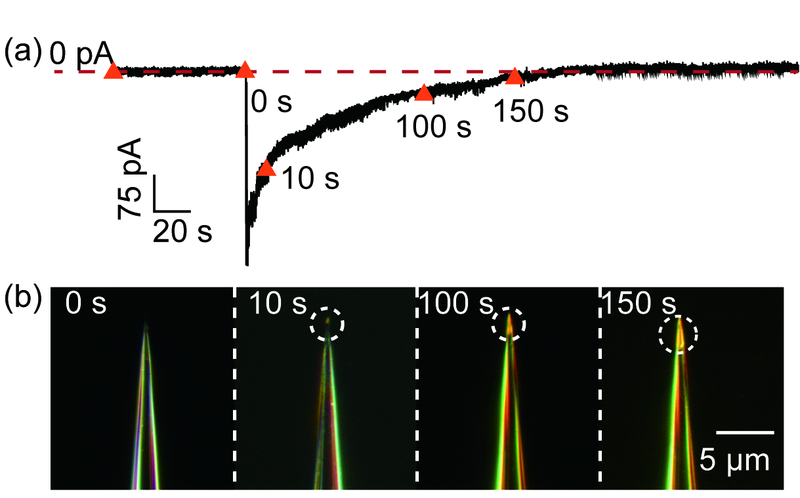 Insert: a typical spike signal of a 30 nm gold nanoparticle collision. (B) A current trace without nanoparticles and after addition of 30 nm gold nanoparticles in the trans side of the closed-type WNE. This figure has been modified with permission from previous work25. Please click here to view a larger version of this figure. Fabrication of a well-defined nanopipette is the first step in the closed-type WNE fabrication process. 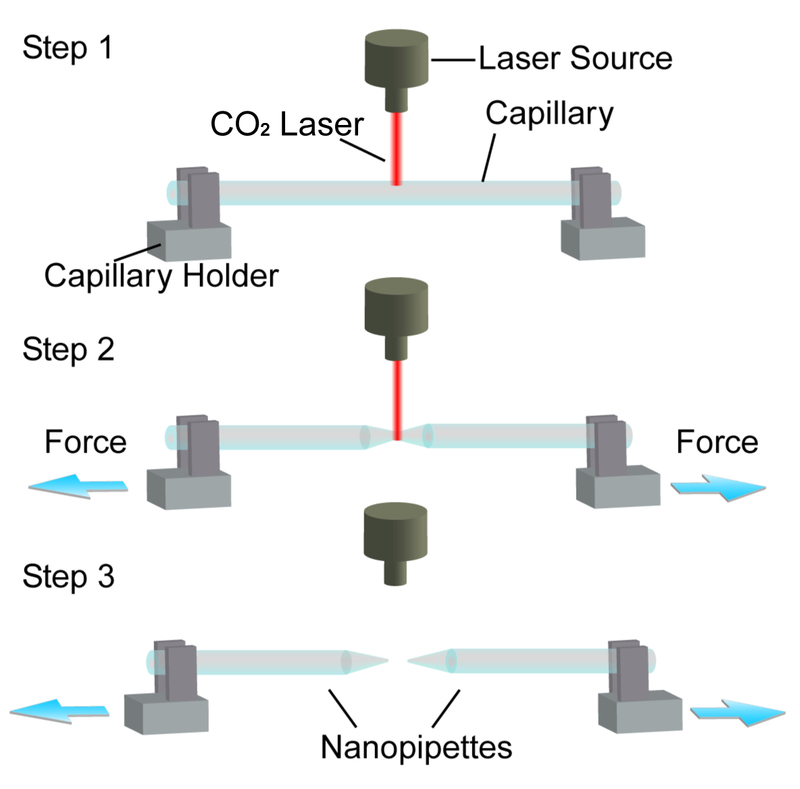 By focusing a CO2 laser onto the center of the capillary, one capillary separates into two symmetrical nanopipettes with nanoscale conical tips. The diameter is easily controlled, ranging from 30-200 nm, by adjusting the parameters of the laser puller. It is noted that the parameters for pulling can vary for different pipette pullers. The environmental temperature and humidity can also influence the final diameter of the nanopipette. After fabrication of the nanopipette, a chemical reaction generates the solid nanotip inside the nanopipette. In this protocol, a gold nanotip is formed by the reduction of HAuCl4; other metal nanotips can be fabricated by designing corresponding reactions. After full blockage of the nanopipette tip, the electrochemical polarization of the generated gold nanotip promotes its further growth according to bipolar electrochemistry. An in-situ electro-optical characterization system is then constructed to achieve simultaneous recordings of the current traces and optical information during the growth process of the gold nanotip. For characterization, calcium ion fluorescence detection helps verify whether the gap is generated between the inner wall of the pipette and the gold nanotip. For a well-defined closed-type WNE, the tip area should be invariably dark in the fluorescence image. Also, SEM can be used to characterize both the nanopipette and closed-type WNE. FIB may be employed to sculpt along the sidewall of the closed-type WNE to expose inner metal for the subsequent SEM imaging. Therefore, the length and inside structure of close-type WNE can be determined. Following its characterization, the well-prepared closed-type WNE is capable to be used for further applications. This protocol for closed-type WNE paves a new path for electrochemical measurements of single nanoparticles with high reproducibility. However, there are still some challenges and limitations in this fabrication process. The first limitation involves the diameter of the nanopipette tip. Theoretically, when the tip diameter decreases to a single-molecule size, the current resolution can be dramatically enhanced. However, it is challenging to pull a nanopipette with a diameter under 30 nm with the existing pulling strategy. The potential of this closed-type WNE protocol can be expanded to practical applications in nanosensing. By incorporating traditional nanoelectrodes with a scanning electrochemical microscope, the closed-type WNE can reveal dynamic electrochemical mapping for some special 2-D/3-D nanomaterials. 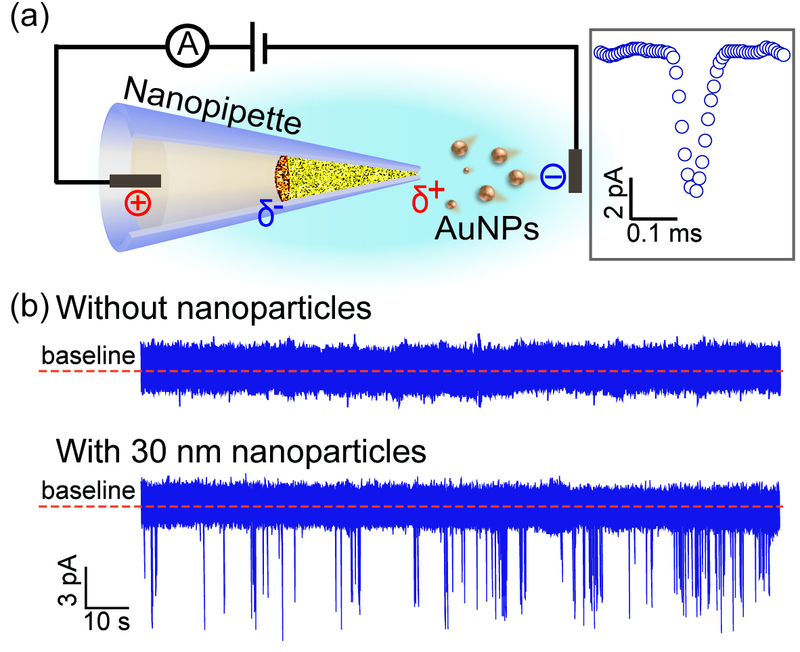 Moreover, the plasmonic resonance scattering of the gold nanotip can be used to simultaneously detect the electron transfer process by both electrical readout and optical recording. By virtue of its geometrical properties, the closed-type WNE with a conical nanotip is suited to cellular analysis with low mechanical damage. This research was supported by the National Natural Science Foundation of China (61871183，21834001), Innovation Program of Shanghai Municipal Education Commission (2017-01-07-00-02-E00023), the “Chen Guang” Project from the Shanghai Municipal Education Commission and Shanghai Education Development Foundation (17CG27). Vajda, S., et al. Subnanometre platinum clusters as highly active and selective catalysts for the oxidative dehydrogenation of propane. Nature Materials. 8, (3), 213-216 (2009). Liu, G. L., Long, Y. T., Choi, Y., Kang, T., Lee, L. P. Quantized plasmon quenching dips nanospectroscopy via plasmon resonance energy transfer. Nature Methods. 4, (12), 1015-1017 (2007). Hu, J. S., et al. Mass production and high photocatalytic activity of ZnS nanoporous nanoparticles. Angewandte Chemie International Edtion. 44, (8), 1269-1273 (2005). Martinez, B., Obradors, X., Balcells, L., Rouanet, A., Monty, C. Low temperature surface spin-glass transition in γ-Fe 2 O 3 nanoparticles. Physical Review Letters. 80, (1), 181 (1998). Fang, Y., et al. Plasmonic Imaging of Electrochemical Reactions of Single Nanoparticles. Accounts of Chemical Research. 49, (11), 2614-2624 (2016). Mirkin, M. V., Sun, T., Yu, Y., Zhou, M. Electrochemistry at One Nanoparticle. Accounts of Chemical Research. 49, (10), 2328-2335 (2016). Murray, R. W. Nanoelectrochemistry: metal nanoparticles, nanoelectrodes, and nanopores. Chemical Reviews. 108, (7), 2688-2720 (2008). Anderson, T. J., Zhang, B. Single-Nanoparticle Electrochemistry through Immobilization and Collision. Accounts of Chemical Research. 49, (11), 2625-2631 (2016). Fu, K., Bohn, P. W. Nanopore Electrochemistry: A Nexus for Molecular Control of Electron Transfer Reactions. ACS Central Science. 4, (1), 20-29 (2018). Zaino, L. P., Ma, C., Bohn, P. W. Nanopore-enabled electrode arrays and ensembles. Microchimica Acta. 183, (3), 1019-1032 (2016). Katemann, B. B., Schuhmann, W. Fabrication and Characterization of Needle-Type. Electroanalysis. 14, (1), 22-28 (2002). Penner, R. M., Heben, M. J., Longin, T. L., Lewis, N. S. Fabrication and use of nanometer-sized electrodes in electrochemistry. Science. 250, (4984), 1118-1121 (1990). Watkins, J. J., et al. Zeptomole voltammetric detection and electron-transfer rate measurements using platinum electrodes of nanometer dimensions. Analytical Chemistry. 75, (16), 3962-3971 (2003). Liu, Y., Li, M., Zhang, F., Zhu, A., Shi, G. Development of Au Disk Nanoelectrode Down to 3 nm in Radius for Detection of Dopamine Release from a Single Cell. Analytical Chemistry. 87, (11), 5531-5538 (2015). Li, Y., Bergman, D., Zhang, B. Preparation and electrochemical response of 1-3 nm Pt disk electrodes. Analytical Chemistry. 81, (13), 5496-5502 (2009). Kasianowicz, J. J., Brandin, E., Branton, D., Deamer, D. W. Characterization of individual polynucleotide molecules using a membrane channel. Proceedings of the National Academy of Sciences of the United States of America. 93, (24), 13770-13773 (1996). Cao, C., et al. Discrimination of oligonucleotides of different lengths with a wild-type aerolysin nanopore. Nature Nanotechnology. 11, (8), 713-718 (2016). Cao, C., Long, Y. -T. Biological Nanopores: Confined Spaces for Electrochemical Single-Molecule Analysis. Accounts of Chemical Research. 51, (2), 331-341 (2018). Sha, J. J., Si, W., Xu, W., Zou, Y. R., Chen, Y. F. Glass capillary nanopore for single molecule detection. Science China-Technological Sciences. 58, (5), 803-812 (2015). Ying, Y. L., Zhang, J., Gao, R., Long, Y. T. Nanopore-based sequencing and detection of nucleic acids. Angewandte Chemie International Edition. 52, (50), 13154-13161 (2013). Lan, W. J., Holden, D. A., Zhang, B., White, H. S. Nanoparticle transport in conical-shaped nanopores. Analytical Chemistry. 83, (10), 3840-3847 (2011). Karhanek, M., Kemp, J. T., Pourmand, N., Davis, R. W., Webb, C. D. Single DNA molecule detection using nanopipettes and nanoparticles. Nano Letters. 5, (2), 403-407 (2005). Morris, C. A., Friedman, A. K., Baker, L. A. Applications of nanopipettes in the analytical sciences. Analyst. 135, (9), 2190-2202 (2010). Yu, R. -J., Ying, Y. -L., Gao, R., Long, Y. -T. Confined Nanopipette Sensing: From Single Molecules, Single Nanoparticles to Single Cells. Angewandte Chemie Interntaional Edition. (2018). Gao, R., et al. A 30 nm Nanopore Electrode: Facile Fabrication and Direct Insights into the Intrinsic Feature of Single Nanoparticle Collisions. Angewandte Chemie Interntaional Edition. 57, (4), 1011-1015 (2018). Ying, Y. L., et al. Asymmetric Nanopore Electrode-Based Amplification for Electron Transfer Imaging in Live Cells. Journal of the American Chemical Society. 140, (16), 5385-5392 (2018). Gao, R., Ying, Y. L., Hu, Y. X., Li, Y. J., Long, Y. T. Wireless Bipolar Nanopore Electrode for Single Small Molecule Detection. Analytical Chemistry. 89, (14), 7382-7387 (2017). Gao, R., et al. Dynamic Self-Assembly of Homogenous Microcyclic Structures Controlled by a Silver-Coated Nanopore. Small. 13, (25), 1700234-n/a (2017). Kim, B. K., Kim, J., Bard, A. J. Electrochemistry of a single attoliter emulsion droplet in collisions. Journal of the American Chemical Society. 137, (6), 2343-2349 (2015). Lee, P. C., Meisel, D. Adsorption and surface-enhanced Raman of dyes on silver and gold sols. Journal of Physical Chemistry. 86, (17), 3391-3395 (1982). Steinbock, L. J., Otto, O., Chimerel, C., Gornall, J., Keyser, U. F. Detecting DNA folding with nanocapillaries. Nano Letters. 10, (7), 2493-2497 (2010). Gong, X., et al. Label-free in-flow detection of single DNA molecules using glass nanopipettes. Analytical Chemistry. 86, (1), 835-841 (2013). Cadinu, P., et al. Double Barrel Nanopores as a New Tool for Controlling Single-Molecule Transport. Nano Letters. 18, (4), 2738-2745 (2018). Bell, N. A., Keyser, U. F. Digitally encoded DNA nanostructures for multiplexed, single-molecule protein sensing with nanopores. Nature Nanotechnology. 11, (7), 645-651 (2016).